So, you have a program and you are going along well, and all of a sudden, you are experiencing a lot of frustration as you cannot break through what you think is a plateau in strength. You are pushing really hard, your are trying to lift more each week and everytime you come to test, you are not getting the rewards you think you deserve. THis is a 205kg bench press by Odell Manuel, Definitely the strongest person I have ever had anything to do with in coaching. We are at the start of a strength cycle and we are working towards increasing his PB’s from his last competition. 1. Why velocity? Research over a bunch of years has shown that VBT (Velocity based training) has some really positive implications on managing fatigue or the ability to recover from sessions. So, if Odell can do this session at the average velocity over 4 repetitions – 3 sets at 0.35m/s we know we are training maximal strength. This is good, as this is the goal we have in mind. However, you look at the interset variation between reps. Athletes are all different. Different in all types of abilities. Some really strong people are just not that great at producing repetitions in sets, they fatigue quickly from a Central Nervous System level. Therefore, as coaches, its our jobs to figure this out and program them differently to someone who literally thrives on volume as their pathway forward to getting stronger (usually female athletes and beginners). So, if we know that we are seeing a consistent 0.36ms velocity for the first 3 reps then a drop to 0.24 say on the last set, we figure that this should be the last rep. Once we are under 0.20, we are approaching maximal effort and maximal intensity in that set, and we know that if we do this all the time, injury risk rises. In this set, Odell drops sharply on the 4th rep and this is fairly consistent across the 3 sets we did this session. So, what we know though is that the first 3 reps are the money reps so to speak. We know that 205 moves at 0.35ms on average and if we discount the 4th reps, its closer to 0.4ms, which is some impressive speed for a paused bench press at that weight! 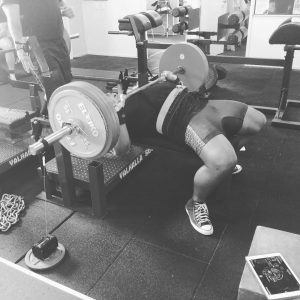 As a Strength and Conditioning Coach who has formed a distinct enjoyment from powerlifting coaching and who is always learning, I try to bring the science of getting strong into a powerlifting mindset and look at how we can train for longer, without injury. That is guaranteed success. Without injury, you can keep getting stronger and never have to stop training. Velocity based devices from Gym Aware are expensive, however keep watch and follow Gym Aware because we know they are getting close to releasing a wireless version, that will be affordable for everyone is somewhat serious about training in the coming months! You can see what you can see. However its hard to measure what we see. The difference with VBT is you can measure what you see and you can draw comparisons that are real and measurable and hold your lifter to account and also help make significant training decisions, such as when to deload (earlier than planned because of a noticable drop in velocity) and when to stop in a set, so you can do another one without over fatiguing the athlete in a session. In all the things that we see in the world of Powerlifting, this is one tool that can change short and long-term outcomes. Its something that I would highly recommend looking into and utilising. Its not replacing your coaching eye, or the “feel” of a lift, but is is providing you objective data that you can use to coach an athlete long-term to help them break through plateaus. The reference point back to this I will reference a great coach and a good friend Amir Fazelli, who put a post up a while back saying that its not “necessary” to lift heavier in training ALL the time. Lifting close to the same weights but improving how we do this in training and not going to the absolute maximal effort or intensity is sometimes better and will yield better results on competition day. This is what Velocity based training will help you do. Provide a reference point to compare from that is measurable.